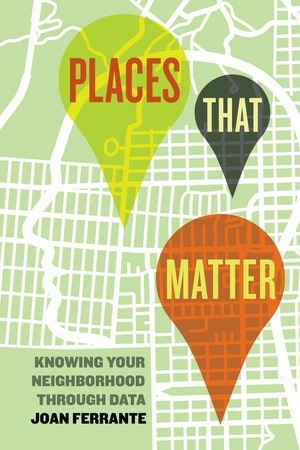 Places that Matter asks the reader to identify a place that matters in their life—their home, a place of worship, a park, or some other site that acts as an emotional and physical anchor and connects them to a neighborhood. Then readers are asked: In what ways do I currently support—or fail to support—that neighborhood? Should support be increased? If so, in what ways? Joan Ferrante guides students through a learning experience that engages qualitative and quantitative research and culminates in writing a meaningful plan of action or research brief. Students are introduced to basic concepts of research and are exposed to the experiences of gathering and drawing on data related to something immediate and personal. The class-tested exercises are perfect for courses that emphasize action-based research and social responsibility. The book’s overarching goal is to help students assess their neighborhood’s needs and strengths and then create a concrete plan that supports that neighborhood and promotes its prosperity. Accompanying the book is a facilitator’s companion website to guide action-based research experiences, which includes rubrics that are aligned to common learning objectives and are also designed to make tracking and reporting easier. Joan Ferrante is Professor of Sociology at Northern Kentucky University, author of Sociology: A Global Perspective and Seeing Sociology: An Introduction, and coauthor with Prince Brown Jr. of The Social Construction of Race and Ethnicity in the United States. She is creator and director of the Mourning the Creation of Racial Categories Project.